I have known Pamela Smilow and her studio, Smilow Mattiesen, for over twenty years. I have filled my home with their whimsical heartwarming artwork. I finally found a collaborative opportunity with Pamela and you can get a peek of those products below along with a thoughtful interview. When did you decide you wanted to be a painter? Where did you learn your craft? I never officially decided to be a painter but ever since I was very young art is what I most loved to do. My mother told me that when I went to nursery school (which was incidentally at Sarah Lawrence College) I would bee-line to the easel and spend all my time there. We always had a lot of art supplies in the house - my dad was a modern furniture designer, painter and sculptor. My mom was always big on craft projects for me and my sister. In addition, I grew up in a Frank Lloyd Wright community - architecture, art and design were quintessential elements of my childhood. My passion was always art and I just always knew that an artist is what I would be. What mediums do you work in? Which is your favorite and why? I have worked in a variety of mediums over the years - everything from paint, linoleum cuts, etchings, knitting, embroidery, sewing, and ceramics, and I think exploring all different types of materials and art forms is a great thing to do as an artist. I love the variety and I think one medium informs another. Today I am primarily a painter and devote most of my time to that - but have always incorporated many different types of materials and techniques into my painting including collage elements, acrylic paint, printmaking, sewing, and writing. Collaborating with Pamela on our new collection - Painters' Series! Playing with how her prints and paintings work with the studios' designs! How did your collaboration with Gert change your approach, process, and ultimately, your work? Collaborations always take you places you wouldn’t go on your own and they are a wonderful exercise in letting go. I had the good fortune of having almost thirty years working alongside my husband, Danish artist Gert Mathiesen (1951-2013). He was an inspiration in his originality and passion. In addition to our own work, we had a lot of fun working together in a variety of different mediums, often literally passing the pieces back and forth. We worked on everything from large scale site-specific paintings, all sorts of mixed media prints large and small, pottery, bias reliefs in ceramics and linoleum, plaster casting, and a huge variety of small paper drawings, prints and paintings. Although Gert’s and my work looks very different on the outside, our art actually has many points of similarity. We were both painters who painted “from the gut,” we were less interested in the conceptual and more in the primitive, and we both valued artists whose approach was raw - children’s art, self taught artists, “outsider” art. Gert was more of a storyteller in his work and I was more interested in color and composition but in the end I think our partnership had a positive and expanding effect on both of our work. I think we definitely influenced and enriched each others work in so many ways but it would be hard for me to put it into words, especially because our collaboration went so much further than just in our art. Who is your favorite artist if you had to name one, and why? I love so many artists but if I had to name just one, it would definitely be Picasso. He did it all and in every medium he touched, he was phenomenal. What is your favorite color to work with, if you had to name one, and why? Asking if I have a favorite color is a little like asking which of my children is my favorite! I love them all! And it keeps changing. Right now I am in a pink phase. When I was young my favorite color was purple. I never had much use for green but now I consider it one of my favorite colors. I love the blues - my favorite Crayola crayon color when I was small was midnight blue. At the same time, I also love working in black and white. What are your future goals for your work? What are my future goals for my work - funny question! I don’t think that way. I just do. I don’t have a master plan except to keep going, keep exploring, try to stay fresh and innovative, and see where that takes me. 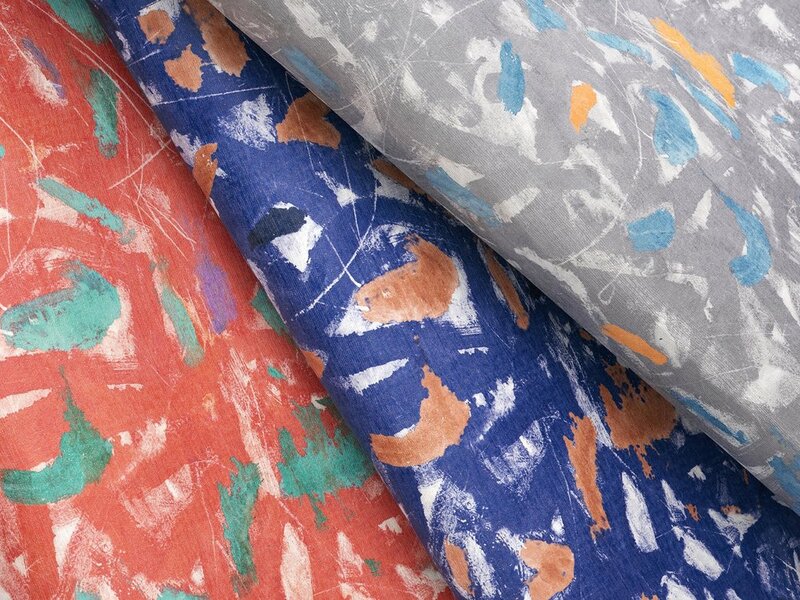 Expressions, a new wallcovering, is based on Pamela's painting - you can glimpse the original in a photo above! Stay tuned for more information about our upcoming Painters' Series Collection! I first heard of Alabama Chanin when founder, Natalie Chanin told her story on The Moth - absolutely my favorite radio show. Founded in 2000 in Florence, AL, Alabama Chanin began as a small collection of handmade garments stitched from recycled t shirt jersey. As interest grew, so did the company, and Alabama Chanin now includes a gorgeous hand sewn high fashion line, a machine sewn ready-to-wear organic cotton jersey line, and The School of Making. Alabama Chanin releases two high end fashion collections a year. Made from organic, american grown, spun and knit cotton jersey, the high end Alabama Chanin line builds on the signature techniques and aesthetics. 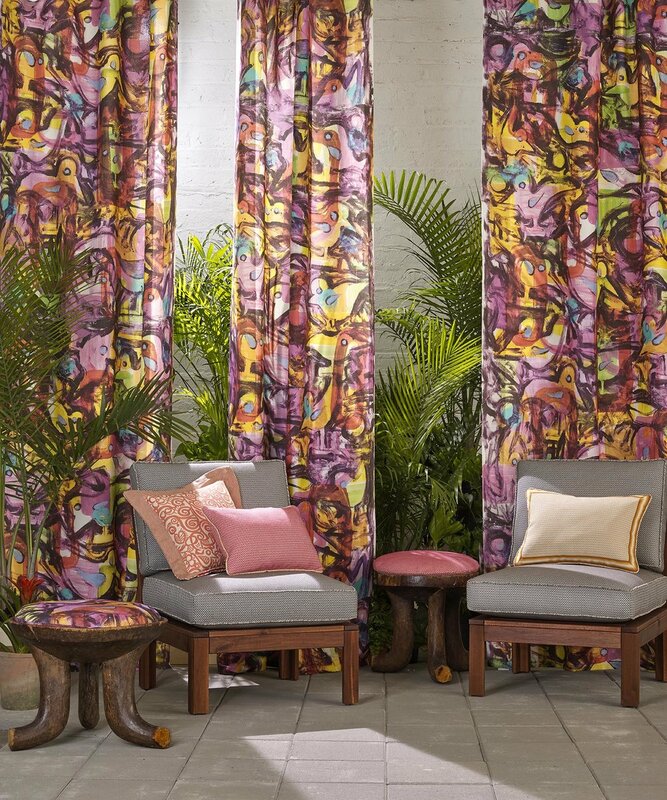 All printing, painting, beading, stitching and seams are done entirely by hand by skilled craftspeople in the Southern United States. In 2013, Alabama Chanin introduced Building 14, where their ready to wear, machine sewn line is produced. The timeless silhouettes are the same as in the Collection, but the styling is simplified, without the intricate handwork. A simpler line of clothing, still made entirely in the United States from organic cotton jersey these pieces can be mixed with the Collection, or worn alone. If DIY is more your scene, Alabama Chanin produces DIY kits that allow you to make some of their heirloom Collection pieces yourself. First time in Paris with my girls! 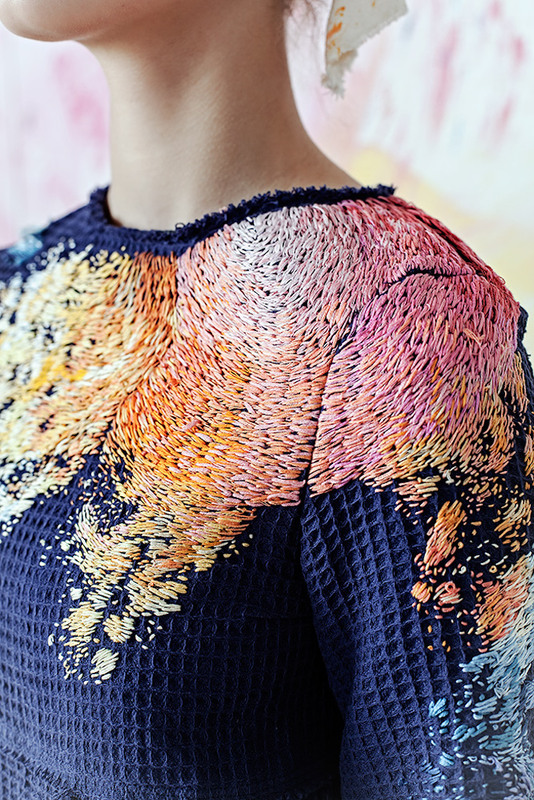 Moscow based textile artist Lisa Smirnova creates stunning, multi hued clothing pieces with her signature style of embroidery. Collaborating with Russian designer, Olya Glagoleva, the two beautifully highlight the stains and wear and tear an article of clothing accumulates over a lifetime. The finished pieces are both beautiful, and equally interesting. 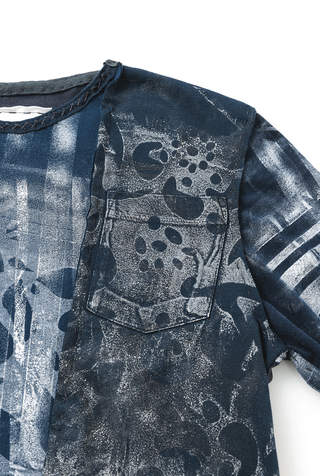 Simultaneously wearable and a one of a kind work of art. Smirnova used the paint markings on her studio clothes as inspiration for these pieces, noting where the garments are particularly prone to stains or tears, and then painting on these pieces before embrodiering them. The collaboration with Olya Glagoleva, and the line of clothing created was back in 2016 - but Smirnova is onto new embrodiered works, most recently these lush almost painterly portraits of authors and artists. See more of her work here. My first baby (Emma) turns sixteen today! A few weeks ago when I was in Seattle I was able to go visit the exhibit 'Chihuly; Garden and Glass.' A long term and ambitious exhibition, 'Garden and Glass' opened in Seattle Center in 2012, and has an astounding collection of Chihuly's signature brightly colored glass sculptures. Chihuly was born in Tacoma, Washington, and it seems very fitting that such an homage to his work and life would be on display in the Pacific Northwest. I imagine the typical Seattle weather sets off the jewel-toned glass in a lovely way - although we had beautiful weather on the day I visited. Chihuly's signature style of organic, slightly representative but abstract sculptures was on full display, and interacting beautifully with the flowers and gardens. Within the 'Gardens and Glass' exhibit, there are three components - The Garden, The Glasshouse, and The Interior Exhibits. Each space allowing for the work to be shown in a different way. It is a large and wide ranging show, and a wonderful way to spend an afternoon in Seattle! At the Moth Ball! Click here for a bit more about one of my favorite events, supporting a wonderful organization! A few weeks ago the studio was lucky to visit the incredible studio of textile artist, Helena Hernmarck. I absolutely love the way she organizes all of her wool on this long studio wall in a color gradation. Helena is known for her intricate and site specific tapestries. Her work is oftentimes designed for architectual spaces, and monunmental in scale. Helena weaves all of her tapestries by hand (for instance the two above are part of a four piece series, each 20 feet long! ), and about 250 pounds of wool. Helena was born in Sweden, and although she now works out of her studio in Connecticut, she exclusively sources her wool from a small family run factory in Sweden. All of her wool is Rya wool - native to Sweden and made famous in the early 1960s by Rya rugs and bedspreads in Scandinavian decor. The subtle color variations and painstaking work that goes into each handwoven tapestry is absolutely mind boggling. Most of Helena's work is figurative, with delicate shading and visual depth in each piece. 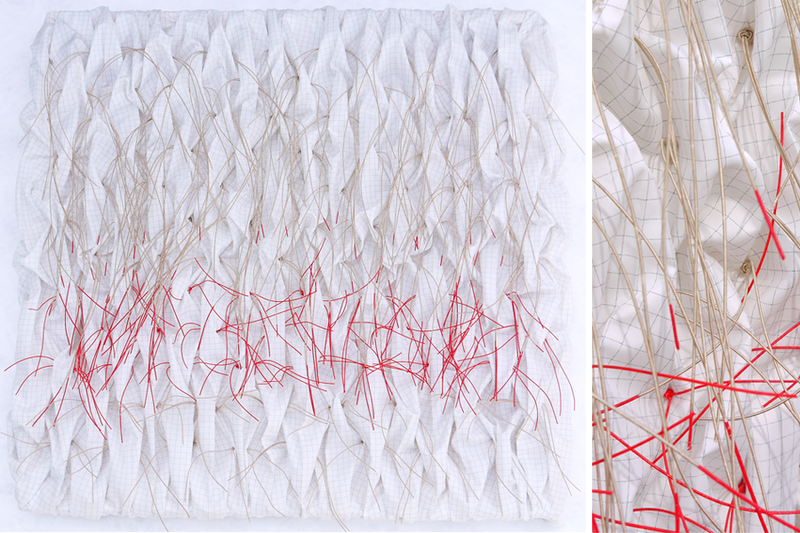 When we toured her studio, Helena showed us some of her new works in progress, and how the studio brings each weaving to life. When I visited Las Vegas a few weeks ago, we did a fabulous paste paper workshop with the Wynn design team. Such fun and such a lovely group of people! Andy Goldsworthy is a pioneer. Goldsworthy is considered a "sculptor and environmentalist." His work uses natural and/or found materials for site specific sculpture installations that explore repetitive process, and the passage of time. Living and working in Scotland, Goldsworthy credits much of his artmaking process to years spent working on rural farms during his childhood. For his more ephemeral works, Goldsworthy uses foraged materials (leaves, flowers, twigs), his hands and rudimentary tools. For works that are meant to be permanent, such as "Roof", "Stone River" and "Three Cairns" Goldsworthy uses machine tools. Decay is an integral part of Goldsworthy's work. All of his pieces are made in nature from natural materials, and experience the life cycle associated with that. The more delicate sculptures from flowers or leaves have a short lifespan, the "permanent" sculptures made from stone have longer life cycles, but change and evolve during that time. Experiencing Goldsworthy's work at different times of year can transform a piece. Take for instance, "A Wall" at Storm King in upstate New York. This piece is very different in the winter snow and ice than it would be in the early spring or during foliage season. The way the pieces change with the seasons is all part of Goldsworthy's overall vision for the pieces and his appreciation of their natural surroundings. A few weeks ago the studio was able to go see "Leaning Into the Wind - Andy Goldsworthy" at the Film Forum. It was a lovely afternoon and we would all highly recommend the film if you have the chance! Lea Feinstein is a contemporary painter based out of Stanford, California. 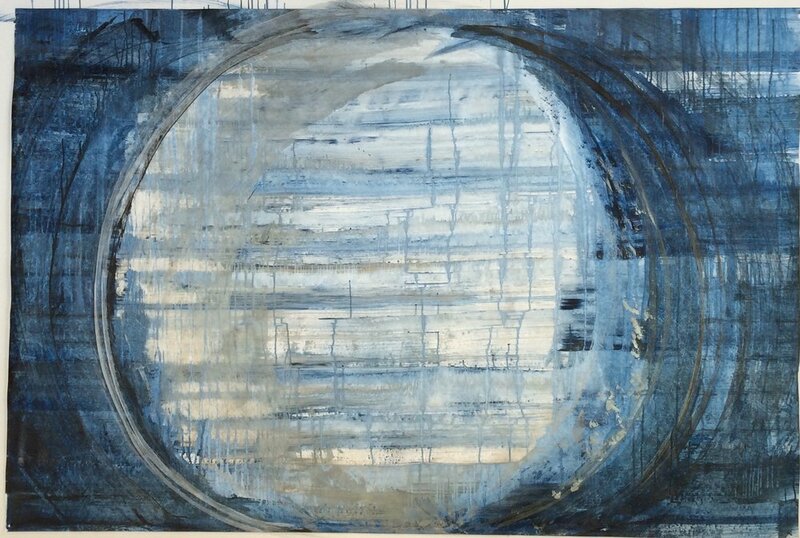 Her work is inspired by California's varied landscape, she writes "[t]hese paintings…are inspired by regular flow patterns occurring in widely disparate phenomena—vapor trails merging and dissipating in the sky, rivers joining, blood flowing in the circulatory systems of living beings, sands shifted by the tides, and rain streaming on glass. Working primarily with acrylic on unusual substrates - such as Tyvek - Feinstein's work has a strong sense of movement and energy. Feinstein gravitates toward Tyvek since "It is inexpensive, acid free, and extremely tough and lends itself to manipulation in both two and three dimensions, which suits my inclination to explore a material deeply." Feinstein paints, folds, dyes, crumples and manipulates her paintings to create dimension and depth to her work. A fabulous time was had by all on our trip to the Turks last week for the kids' school break! I first saw the work of Thompson Street Studio early last year. Something about the playful construction and sophiscated colors of these fabric collage quilts really caught my attention. Kiva Motnyk started Thompson Street Studio in 2014, drawing on her history working as a textile designer for home and apparel and inspired by her family home - a SoHo loft that has been a communal artist space since 1976. Motnyk's curtated collections range from interior goods, quilts, table runners, and rugs to wearable textiles, like the kimono above. Working with artisans from around the world, Thompson Street Studio celebrates the perfectly imperfect nature of handmade goods. Ceramics from Jasiu Krajewski in Tennessee, handmade quilts from Jessica Ogen, and kimonos from Susan Cianciolo round out the offerings. Today our friends from Humanscale are in our studio for a photoshoot. It's always so fun to have a new creative energy in this space!